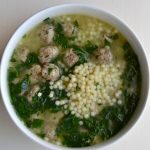 By combining elements of a few different Italian wedding soup recipes, I was able to create the ULTIMATE Italian wedding soup recipe. My whole family loves it, and you will, too. Check out the rave reviews! In the soup aisle of Target, my tear-streaked five-year-old was looking forlornly at the spot where “Favorite Soup” used to reside. For a year, I’d been scooping up every box of Archer Farms Italian Wedding Soup I could get my hands on during our Target trips. She ate it almost every day for lunch. And sadly, it had been discontinued. 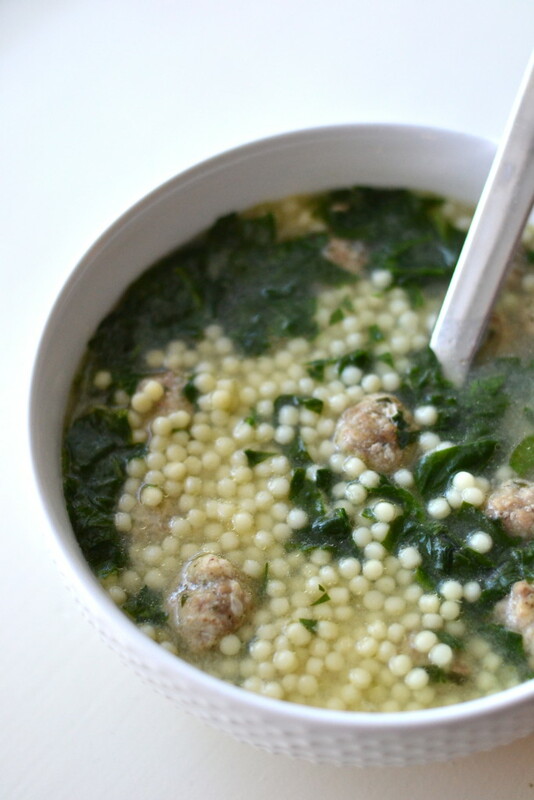 I promised her we’d find another Italian wedding soup just as good; and if not, I’d replicate it myself. The search was long and arduous. We tried brand after brand and none of them matched up. Some had carrots (the horror), others had no pasta (unacceptable), some were too salty, some were too bland, and some were banned by me because the ingredients were unpronounceable. 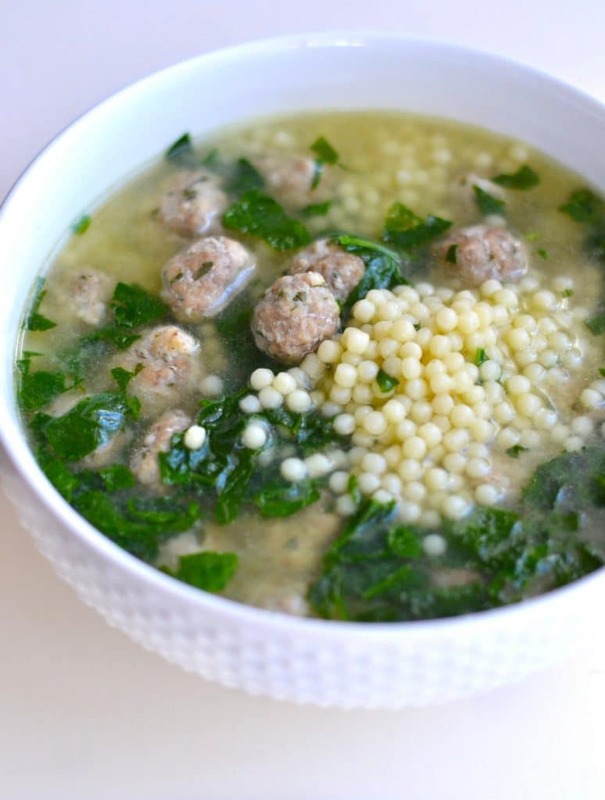 My mom made a homemade version that nailed the same flavor as the original, but it got a “thumbs sideways” because of the too-big meatballs, the use of escarole instead of spinach, and the lack of “tiny pasta balls” that made Favorite Soup the all-time favorite. 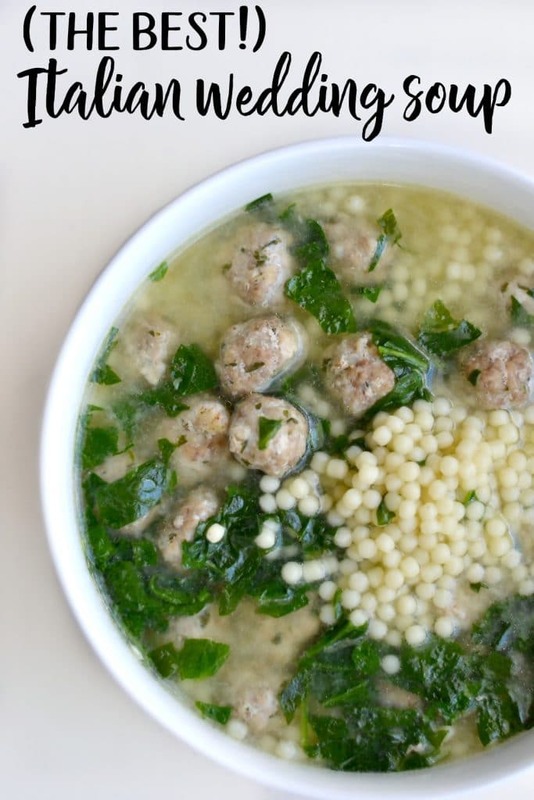 I took the recipe my mom used (from Giada DeLaurentis) and tweaked it to recreate the long-lost Italian wedding soup that my daughter was pining for. Plus, it gave me another easy family dinner to add to my repertoire. We all loved it, and I’ve been making it in double batches ever since. This soup is delicious, comforting, and hearty enough for dinner, especially if you serve it with a salad and some good, fresh crusty bread. Now that I know that my Italian wedding soup recipe is a winner, I always double the meatball part of the recipe, and freeze half of the meatballs for later so that I can quickly make another batch. To do this, just form the second set of meatballs on a baking sheet, and place the baking sheet in the freezer. Once the meatballs are frozen completely, put them into a gallon freezer bag. 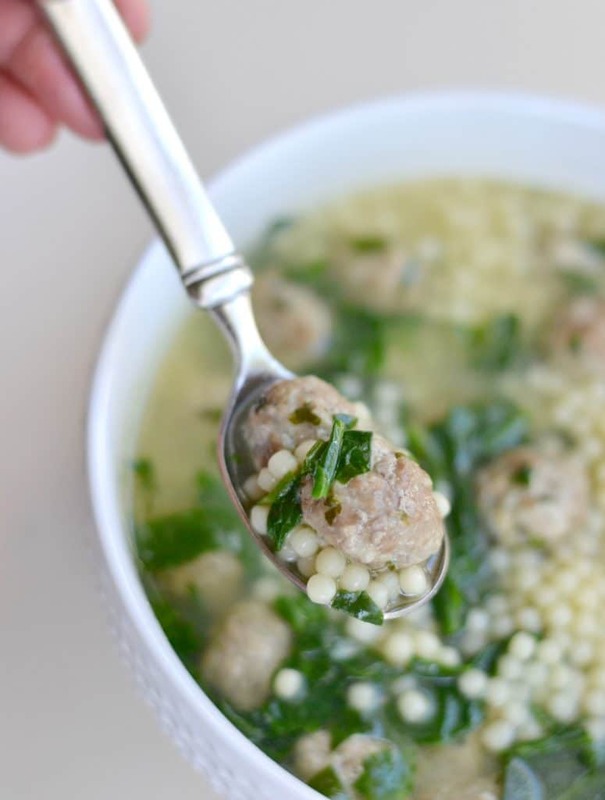 The next time you want to make this soup, just boil the broth, toss in the spinach, frozen meatballs, and pasta, and cook until the pasta and meatballs are done. If you can’t find Acini de Pepe (the name of the tiny pasta balls I use in this recipe), any sort of small noodle will do, such as ditalini or small shells. 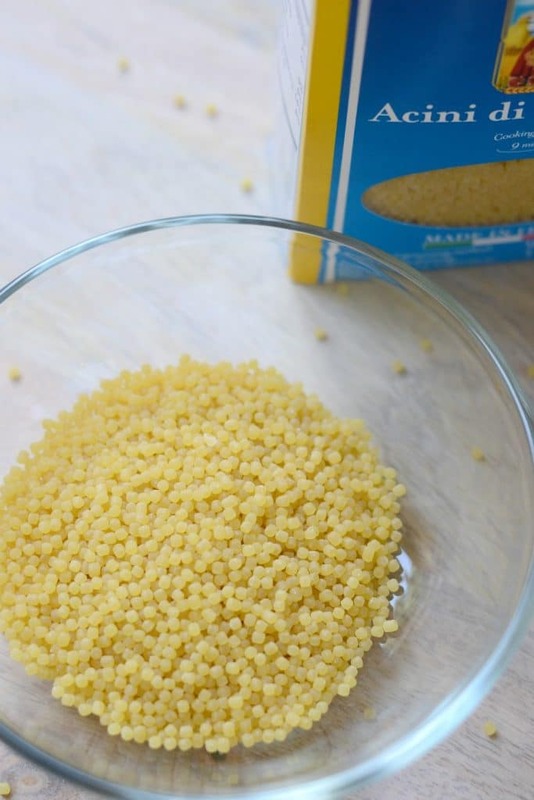 Someone in the comments suggested substituting Israeli couscous, which is also a great idea. If you own a food processor, you can make this recipe even faster by grating/chopping the onion, parsley, garlic, and even the bread right in the processor. If you don’t own one, no worries! It can still be made quickly and easily using a regular grater and a knife. I prefer to use lean pork and beef in this recipe to cut down on grease in the broth. Another alternative is to skim the fat from the broth prior to serving. Some commenters suggested pre-cooking the meatballs in the oven to eliminate grease, but I personally like to cook them directly in the broth because it adds great flavor. To make the meatballs: Stir the first 6 ingredients in a large bowl to blend. Then add the cheese, beef, and pork. 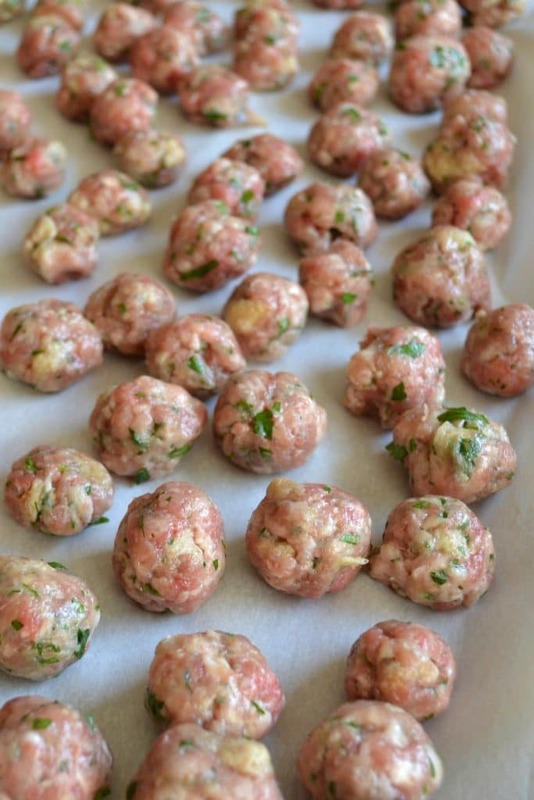 Shape the meat mixture into meatballs, and place on a baking sheet. I prefer the meatballs to be on the smaller side, but you can make them any size you want. To make the soup: Bring the broth and frozen spinach to a boil in a large pot. Add the meatballs (uncooked) and simmer for a few minutes, stirring occasionally to make sure they don't stick. Add the pasta and continue cooking at a low boil until both the pasta and meatballs are cooked (approx 20 minutes). Season with salt and pepper if needed. Sprinkle with parmesan cheese before serving, if you wish. *I use about 8 oz, but we like a lot of pasta in our soup, so use less if you'd prefer it more brothy. Thank you for this great recipe! I have made it several times and always a winner. Even though I am cooking for just my husband and I ( kids are all paired up with their own families) , I make a big batch and share with my elderly neighbours ( just like parents)who are in their 80’s and they just love it . So I make it often so they can enjoy it . Thanks again! 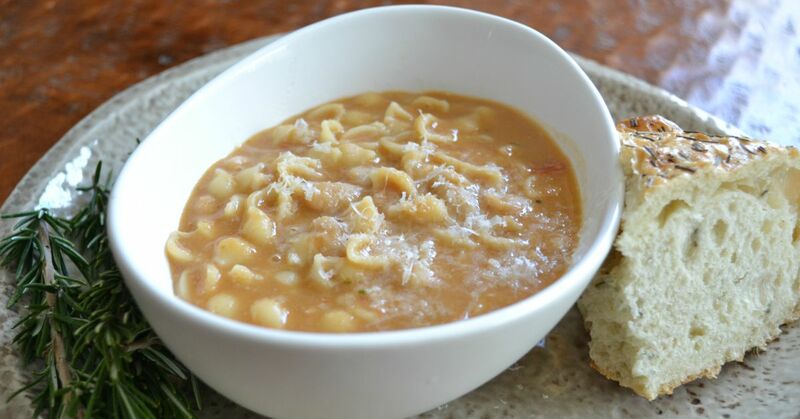 This is the best soup I’ve made, and very easy to make, it’s hearty and goes a long way. While getting everything ready, I accidentally poured the Spinach into the raw meat mixture, I picked out most of it, leaving what I couldn’t get out, and mixed it with meat, I figured it wouldn’t matter, and it turned out great. I also partially baked the meatballs to release some of the fat. I also used the smallest cookie dough scooper to make the meatballs, that saved a lot of time. I had extra meatballs and froze those for use in spaghetti sauce and other recipes. Again this recipe is so very easy to make. I think this recipe freezes very well. I buy it from an Italian deli frozen in quart sizes. It defrosts easily and tastes wonderful.